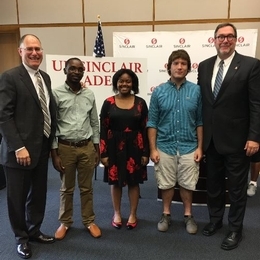 The University of Dayton and Sinclair Community College introduced the first cohort of the UD Sinclair Academy at a press conference on Tuesday, September 13. The partnership between the two schools allows students to begin their studies at Sinclair and earn a bachelor’s degree from the University of Dayton. The pathway program creates an option for a four-year degree for students who may not previously have considered a University of Dayton education. Alexis Hausfeld, a 2016 Hamilton High School graduate. Oscar Ntakontagize, who plans to graduate from Sinclair and transfer into the chemical engineering program. Brandon Swihart, currently a Bethel High School student taking courses at Sinclair through College Credit Plus. Brandon plans to graduate from Sinclair and transfer into the mechanical engineering program. Taylor Stargell, a 2016 Wayne High School graduate enrolled in her first semester at Sinclair. She plans to graduate and transfer into the computer engineering program. Under the University's transparent tuition plan, students will lock in tuition for their junior and senior years at the rate in effect when beginning their first year at Sinclair. Students will be eligible for up to $15,000 in scholarships, as well as scholarships for textbooks and study abroad programs. Additionally, students will have immediate access to University facilities and amenities, including athletic events and peer mentoring. The UD Sinclair Academy will offer 22 majors in the University's College of Arts and Sciences, the School of Business Administration, the School of Education and Health Sciences, and the School of Engineering. Students will seamlessly transfer to the University of Dayton after graduating from Sinclair with their associate degrees. Approximately 90 percent of Sinclair Community College graduates stay in the Dayton region after they complete their credential. The UD Sinclair Academy will open an opportunity for an elite bachelor’s degree that they may not have previously considered for financial reasons. For more information, visit the UD Sinclair Academy page on the University of Dayton website at udayton.edu/academy or contact Julia Thompson, associate director of admission and financial aid, at jthompson@udayton.edu.